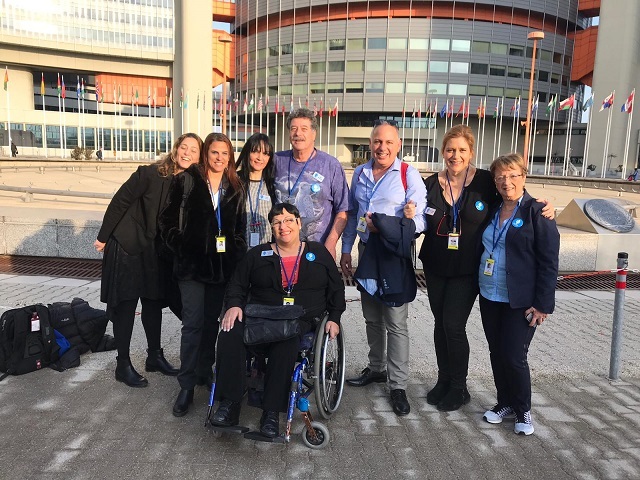 Representatives from Access Israel formed a delegation to attend the Zero Project Conference, an annual conference which takes place at the United Nations office in Vienna - whose focus this year was ‘Independent Living’ and voter accessibility. In attendance were Dr. Revital Schurtz-Swirsky and Rachel Shafek from Access Israel North; Noga Sivan and Ofer Michaeli from The Regional Center for Independent Living in the Galilee; Racheli Regev from Access Israel in Eilat and Arava Area; Sharon Ashtar, a counselor in the field of accessibility for the visually impaired; Or Cohen, who founded the Global Ramp company for integrated accessibility solutions; Tuvia Sheinfeld (2018 Israel Accessibility Conference award winner) from UA, a company that deals with website accessibility; Yossi Elimelech (also a 2018 Israel Accessibility Conference award winner), Director of the Hevel Modi'in Regional Council, who initiated an accessible bus for municipal services; and Michal Rimon, CEO of Access Israel, and Rani Benjamini, co-founder. The focus this year was ‘Accessible and Independent Elections’, so the organization erected a demonstration of ‘inaccessible elections’ alongside the Accessibility Path, and later presented solutions from Israel and other countries for improving voter accessibility. Israeli solutions were presented by representatives from Orcom, UA, and Global Ramp, and we also presented solutions and initiatives from the Enosh and Akim organizations, as well as, of course, Pass It On - an accessible video glossary for the Israeli Elections in sign language, produced by Access Israel. Commission for Equal Rights of Persons with Disabilities in Israel; Hila Hadas, the Director of Enosh, and Dr. Lior David from Enosh. The panel was led by Michal Rimon, CEO of Access Israel, who also presented the organization’s accessibility education projects and took the opportunity to thank and pay dues to The Ted Arison Family Foundation, which has supported and assisted the organization in advancing this important work. At the end of the panel, guests were invited to try out Access Israel’s Accessibility Path experience from the Conference. On one of the evenings during the conference, we were invited to a festive dinner at a small forum, where Mr. Martin Essl, Mr. Michael Fembek, and the directors of Zero Project awarded Michal Rimon (as a representative of Access Israel) a Zero Project Ambassador certificate for her role in promoting the project worldwide. 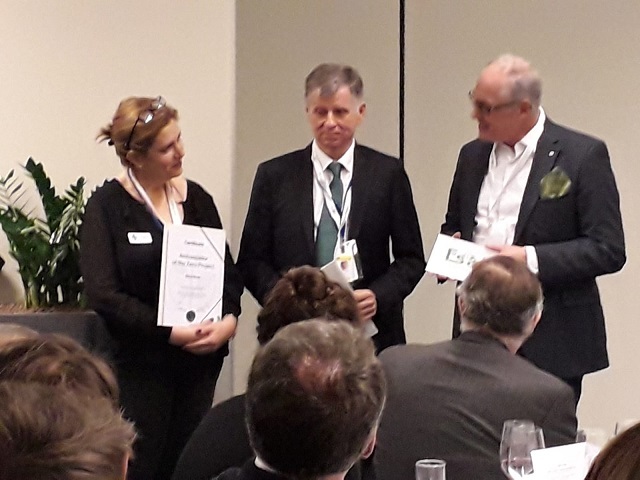 During the celebratory event, eight certificates were awarded for the first time to honorary ambassadors from all over the world - Michal was the sole ambassador from Israel to be honored. 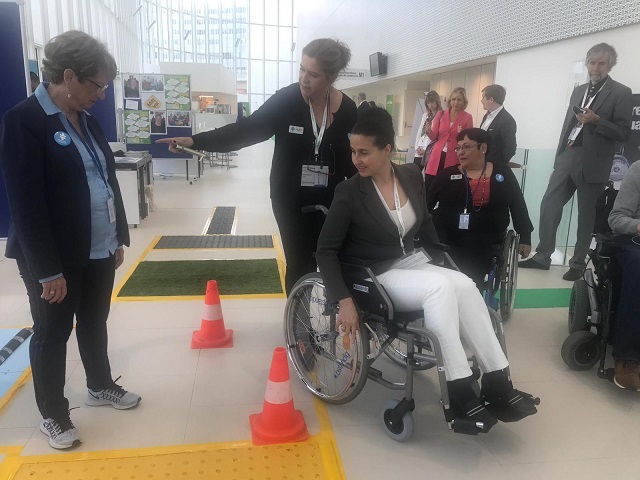 The three days of the conference were captivating, with over 700 people from 85 countries gathered in Vienna to learn and share knowledge on the subject of independent living, accessibility and integration. To finish with a bit of national pride - the Israeli delegation, with over 30 participants, was the largest delegation of all the countries represented (except the hosts). Many conference participants received information and invitations from the Access Israel team to participate in The 7'th Access Israel Annual International Conference, which will take place May 23-27, 2019 in Tel Aviv. We would like to take this opportunity to extend our gratitude to the entire delegation and all our partners.